UFO SIGHTINGS DAILY: Alien Civilisation Fragments Found And Photographed By NASA Spirit Rover, Oct 2016, Video, UFO Sighting News. Alien Civilisation Fragments Found And Photographed By NASA Spirit Rover, Oct 2016, Video, UFO Sighting News. Found by Paranormal Crucible. The long object that looks like a smiling eel is sitting next to a small house. Do you see the windows and the round doorway? Black and white is the hardest for eyes to make out details, so don't worry, give your eyes a few moments to adjust. 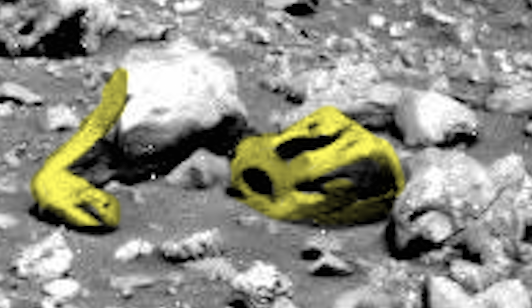 Interesting image from the Spirit Rover archives, these two objects are clearly artificial, possibly space junk or in my opinion intelligently designed, remnants from a past mars civilization. I have gently colorized and enhanced the images, but nothing has changed from the original data, apart from color and lighting, all the clues are their in the raw image, and yes i did notice the bizarre masquerade mask next to the first artifact, just in case your wondering lol.